The head of the TTC union alleges Mayor Rob Ford drove past the open doors of a Toronto streetcar on Wednesday and then got into a confrontation with the driver. Amalgamated Transit Union Local 113 president Bob Kinnear said the driver did not know it was the mayor when he got up from his seat to confront him. TTC spokesperson Brad Ross later confirmed the driver left his seat, adding that he should not have done so. Failing to stop behind the open doors of a streetcar is a violation of the Highway Traffic Act and carries a fine of $109. The mayor was not charged and Ross told the Toronto Star the matter was closed. “It’s a beautiful station. A lot of great architecture has gone into it, a lot of great thinking. The track way is at grade. It’s a central platform station,” he said. Medved described how the concourse will be above the platform where riders will be able to buy tickets. He said access to the concourse will be from a pedestrian overpass. So let me get this straight…the tracks are at-grade and the passengers arrive to the station at the ground level. The northbound tracks are literally steps away, but it is a “beautiful” thing to make them travel needlessly up one level to the concourse, just to go back down again to the platform. Medved reports the station is “on schedule” to open in 2015. This must be some new definition of “on schedule” as the station was actually supposed to open by the end of 2014. Unlike the sleek high-speed trains of Europe and Asia that resemble aluminum birds, the Acela is a steel tank, built to survive collisions in the mixed-use environment of the Northeast Corridor. The 308-passenger Acela weighs 1.2 million pounds, twice as much as Alstom’s 300-passenger, 600,000-pound AGV train. True high-speed trains run on dedicated tracks, free of conflicts with slower commuter trains and heavier freight trains. At least some light is shining on insane FRA policies, though I don’t entirely agree with the last sentence. As part of the EIR process, station area plans have been published by the CA High-Speed Rail Authority for Fresno and Bakersfield (“California High-Speed Rail Fresno-Bakersfield Segment, Part III, Section E“). Here is a rendering of the Bakersfield design (there are several variations, all following the same template). You should click the image to enlarge. And here is a Fresno rending. 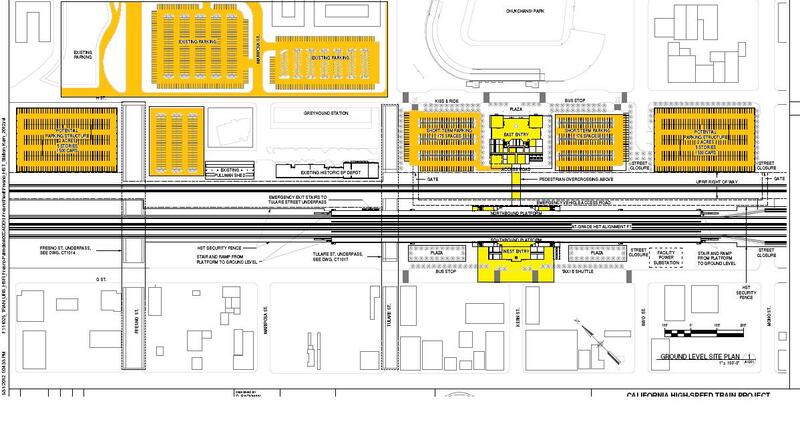 For a downtown location, the Fresno station sure has an abundance of surface parking (parking areas highlighted in orange, the station footprint in yellow). These designs are very underwhelming. 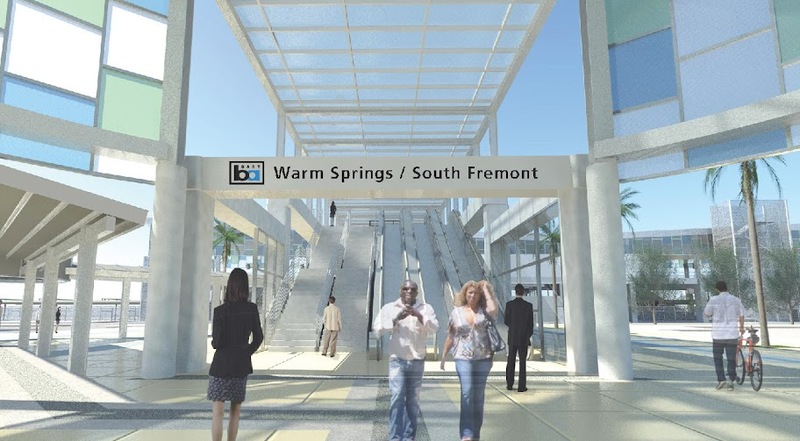 They are so retrograde, it is as if Parsons Brinckerhoff had thawed out 1960’s BART engineers from cryogenic hibernation. The bike/ped access is especially bad. A simple metric for bike/ped accessibility is the walking distance from platform to street. For some destinations, it isn’t too arduous — but for other directions the travel is circuitous. Visitors must cross acres of parking (not to mention the fare gates and possible TSA baggage screening) to reach the street. 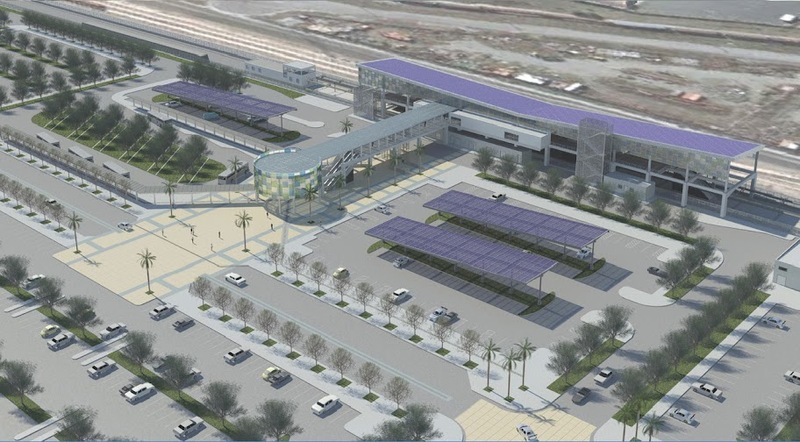 The Bakersfield design is especially lacking because the station would be grade-separated over a roadway, and yet no effort was made to exploit that. Really, the only direct route from platform to street is the emergency staircase. The bike parking is also problematic because no thought was given to inside-the-station secure bike parking. Indeed, bike racks and lockers are relegated to obscure locations, away from foot traffic (making for easy theft). The lack of secure parking is inexcusable as the stations don’t lack for space. Approx. 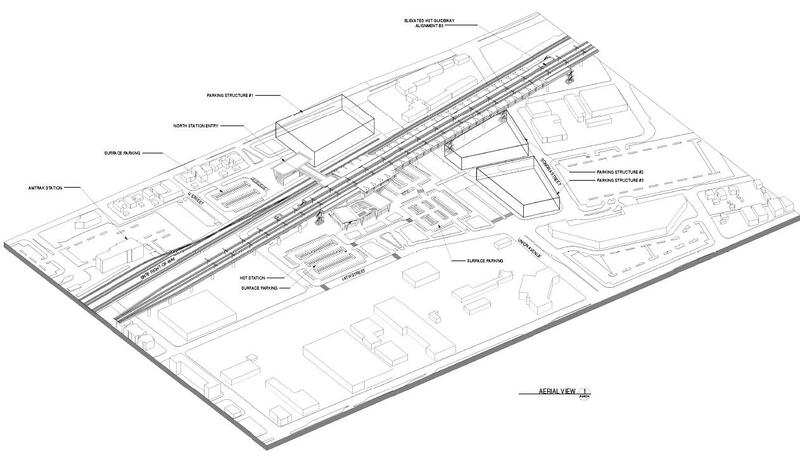 1,000 sq-ft is allocated for a telecommunications and “station computer” center (if this high-speed rail thing doesn’t work out, perhaps Google can use the facility for a data center). Since the stations are situated along the existing freight rail tracks, long pedestrian overcrossings were included; however, the design of the overcrossings is bizarre. Take a look at this view of the Bakersfield station, and note how the freight overcrossing doesn’t line up with the high-speed rail platform. To exit the station, one must go down, then up, then down again! In modern, complex economies, calculating the cost/benefit of a high-speed rail project is virtually impossible. That is because there are too many confounding variables. Pro or Con, one should be dubious of any economic study on HSR. In the latter category, there is a new study from the UCLA Anderson School of Management (California High-Speed Rail and Economic Development: Lessons From Japan). 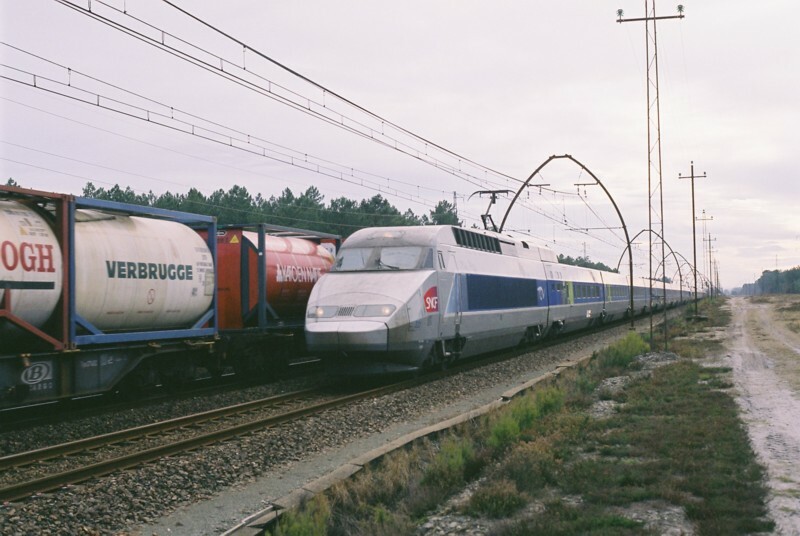 The authors argue against high-speed rail investment as a generator of economic growth. Their methodology was as follows: look for correlations in the economic growth rates of Japanese prefectures depending on whether or not they had Shinkansen service. The authors found no measurable difference between prefectures with Shinkansen stations and those without. This is not a really surprising result. Let us note that Japan has the world’s best passenger rail system, reaching all parts of the country. Areas lacking a Shinkansen station still have really, really good conventional rail service — so good that they might even be considered “high-speed” by US standards. And there is the “network” effect: conventional rail links serve as feeders to the Shinkansen station in the big city. Even worse, the study extrapolates the Japanese experience to California’s high-speed rail project. If the Shinkansen made so little difference in Japan, the authors argue, then surely California would be the same, right? Well, that is a really apples-oranges comparison. California doesn’t already have an extensive and high-quality conventional rail network like Japan. Compared to California’s existing Amtrak service, HSR would be a gigantic improvement in mobility. Now, whether that big gain in mobility results in economic growth is anyone’s guess, but studying the Shinkansen probably doesn’t tell us a whole lot. In what Transdef calls the “speech of his life”, Senator Simitian explains his No vote on the high-speed rail construction. Ten years ago, Simitian co-sponsored the bill that had put the HSR bond measure on the ballot, but has now soured on the project’s mismanagement. The Delhi High Court on Thursday modified its earlier order and directed the Transport Department of the Delhi Government to allow vehicles other than buses to ply in the 5.7-km-long Bus Rapid Transit (BRT) corridor between Ambedkar Nagar and Moolchand flyover in South Delhi till the petition seeking opening up the corridor for three-wheelers and four-wheelers on a permanent basis was decided. The petitioner has sought permission for plying of other vehicles in the corridor arguing that while the carriageway along the corridor got jammed in busy hours due to shrinkage of its width due to the carving out of space for the bus corridor, the exclusive stretch for the bus transport always had empty space to accommodate more traffic. As the NY Times notes, fewer than 20% of Delhi residents travel by private auto.